The Shiseido Men's Skin Empowering Cream is a high-performance type of cream that can revitalize your skin, giving it a healthier, younger appearance. Formulated with carnosine beech bud extract, this cream has excellent moisturizing properties that can be used to alleviate sunspots and wrinkles on your face. 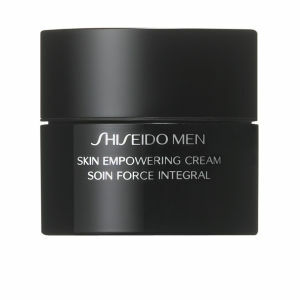 This empowering cream is designed to resist the signs of aging, so you can look your best for as long as possible. Vitamin E properties help protect your skin from free radical damage, which is increasingly present today. To use this cream, simply rub a small amount in your hands and smooth it on portions of your face that show signs of aging.